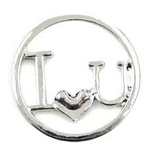 Proud Grandma 30mm Plate Plus Low Prices Everyday on Floating Lockets and Floating Charms! Floating Plates create the perfect backdrop for your floating charms and birthstones. All Plates fit snuggly in the 30mm floating locket. Plates do not affect the number of charms that fit in a locket.